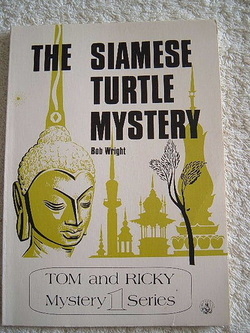 The Siamese Turtles is a book that is about two boys named Tom and Ricky. Ricky is helping his mom get the rocks out of her backyard garden. Tom asked if he could help Ricky get the rocks out of the garden. Ricky said sure. They built a waterfall with the rocks they took out. Tom and Ricky wanted to put turtles in the waterfall, so they went to the new pet store. Ricky asked how much the turtles were that were in the window. The storeowner said they were not for sale. But why weren’t they for sale? I thought that the book was excellent. I enjoyed it because it was about turtles. The book kept my attention and made me want to read more of the book. I thought it was not bad that there were not many people in the story to follow and learn their names. There are good pictures in the story but they aren't coloured. This is one of my favourite mystery books that I have read this year. I recommend this book to young kids, because it is an easy book to read. This book is interesting but is low in vocab because it’s mainly for kids. I also suggest this book to people who like turtles and mystery stories.